I’m Jake, owner of Queens Hood Cleaning. Over the last 17 years, my team and I have completed 4,232 kitchen exhaust system and commercial vent hood cleanings, 392 rebuilds, and 57 emergency restaurant exhaust system repairs. If you can’t tell by the numbers, we love doing this kind of work and we’re good at it, which is why everyone hires us for it. If you’ve been in the restaurant field for a while, you already know why it’s imperative to keep your vent hood as clean as you can. We’ve all seen a restaurant or two go up in smoke on the local news or heard about it through the grapevine. That’s certainly not the situation you want to be in. And, that’s what we’re here to prevent! Our commercial restaurant hood cleaning company near you is loaded with technicians who have worked for the state as inspectors, trained extensively on NFPA 96 and the related local health and safety codes, and gone through rigorous on-the-job training to ensure that we deliver only the highest quality cleaning service to our customers. The plethora of testimonials we’ve gotten, numerous featured stories on the local news, lots of positive reviews, and an A+ with the Better Business Bureau simply serve to solidify our spot as the top commercial kitchen hood cleaners in Queens, New York. ​You run a commercial kitchen. That commercial kitchen could be in an airport, bar, cafeteria, hotel, restaurant, school, or somewhere else. And, something’s going on with the hood or exhaust system, although you’re not exactly sure what. ​It’s got a lot of moving pieces, such as vents, extractor fans, ducts, grease traps, and more. Whether you need a new maintenance company to look at it, a repair done, or a new exhaust system installed, our NYC hood cleaners can help you. If so, contact the best hood cleaners in Queens by calling us right now at (718) 237-1725. The phone will probably ring a few times because we get a lot of calls, but don’t worry – we’ll pick up. Our site is loaded with information on what we do and how we do it. If you have any questions or would like to work with us, give us a call or message us using the form on the page. Aren’t you sick of switching between all the different restaurant hood maintenance companies in Queens? We get it, it bothers us too. One day, you’ve got a company that’s cleaning for you and the next day they’re gone. They’re not present when it counts. That’s not something you’ll ever have to worry about again if you go with us. Queens Hood Cleaning Pros go the extra mile. 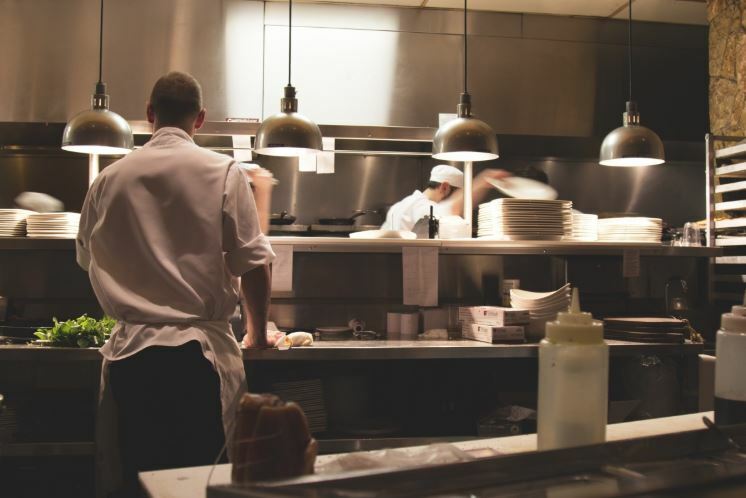 We’ll be there when you need us to be, whether it’s installing a new commercial exhaust hood or making sure your restaurant is cleaned to perfection prior to inspection. Each one of our technicians was hand-picked for our team based on their exhaust hood cleaning. They spend seemingly countless hours learning the latest health codes and safety requirements, especially those surrounding ventilation control and fire safety (NFPA 96) to ensure we can assist companies in maintaining compliance with local, state, and federal laws. It also helps that half of our team used to do restaurant inspections themselves, so they know exactly what to look for and how to avoid violations. Trust our experts to ensure your kitchen is up to par and passes inspections easily. Changing, upgrading, and even cleaning an exhaust hood system may sound easy, but it’s not. With so many interconnected parts, it’s very easy to install something wrong or cause costly damages to crucial elements. Even a dent can affect how smoothly the system runs, which is why we recommend that you call the professionals. We’ll make sure all cleanings and modifications are done with the utmost care to protect your investment. Each one of these warning signs is a clear indicator of a potential problem, which we recommend that you deal with right away. Take a moment to picture what happens. Your restaurant is churning out food constantly, cooking non-stop. Cooking oils and fat are burning, which sends their vapors into the air. As the dirty, smoky air flows through the hood system, it clings to everything in its path, creating a build up of grease on your kitchen equipment, food preparation counters, the walls of the hood, the walls of the vents, the filters, the extractor fan, the grease catch, and sometimes, even the roof. And, that grease is highly flammable. As it’s continually subjected to heat, it increases in temperature and ignites, starting a grease fire. If you’ve ever seen what can happen to a kitchen (or building) in a grease fire, you’d do everything in your power to avoid it. Grease fires spread faster than normal and they’re difficult to put out because water won’t cut it. Oils float on water, so you’ll need a commercial grade fire extinguisher to put it out. Many times, the fire spreads too fast to stop and the staff and patrons are forced to evacuate. When you see a restaurant burn down, a grease fire is often the cause. Worrying about all these potential problems is something you don’t need on your plate (pun intended). Call us instead at (718) 237-1725. We’ll inspect and clean your kitchen from floor to ceiling, all its equipment, and the entire kitchen hood and exhaust system, pointing out any potential problems along the way. If there’s equipment that needs to be serviced or repaired, we’ll give you all possible options so you can make an informed decision. We can install, fix, and sanitize whatever you need. Our Queens, New York technicians offer hood cleanings, kitchen steam cleaning and pressure washing, kitchen equipment cleaning, installation, repair, and maintenance of ventilation & exhaust systems, restaurant inspection preparedness, and more. Why do you recommend that we clean the hood and exhaust system frequently? For the safety of your staff, patrons, and bottom line. In our 17 years in the industry, we’ve seen everything. According to OSHA, more than 2,000 commercial kitchens burst into flames annually, causing hundreds of thousands in damage to buildings and equipment. It almost always starts with grease build-up, so that’s the item to be concerned about. By keeping your vents and everything else clean, you’re preventing fires and securing the future of your restaurant. Don’t be fooled into thinking it won’t happen to you. The greasy residue that’s left over from extensive cooking is very flammable and can spark at any time. Avoid the PR nightmare and staff lawsuits by having your hood and exhaust system cleaned regularly. To that end, we offer a maintenance plan that you’ll find very generous. We can help any commercial kitchen. We’ve gotten calls from: airports, bars, cafeterias, elder care facilities, hotels, motels, schools, and of course, restaurants. We have a large, highly qualified staff, so the size of the job doesn’t make a difference. We can take on a project of any size. We're based in Queens, but we can serve anywhere in New York City. Astoria, Astoria Heights, Ditmars, Little Egypt, Long Island City, Blissville, Hunters Point, Dutch Kills, Queensbridge, Queensview, Queens West, Ravenswood, Sunnyside, Sunnyside Gardens. We don’t have a standard rate because every restaurant kitchen is a little different. Our pricing is based on the size and scope of the work, so please give us a call to discuss your unique needs and we’d be happy to give you a free estimate for our services. If you have any questions, you can also message us by using the form on this page. Contact us at (718) 237-1725 for your free estimate.